Moonbeam City follows the exploits of Dazzle Novak, an idiotic detective who commits more crimes than the criminals he tries to lock up. He teams up with the only competent police officer, Chrysalis Tate, to protect their beloved neon-soaked metropolis. A dangerous crime lord is terrorizing Moonbeam City, but detective Dazzle Novak is distracted. Dazzle is approached by the TV show "Crimezappers" asking him to reenact one of his arrests. A killer dubbed the Moonbeam Maniac wreaks havoc across the city. Dazzle goes undercover beneath the sea, where he falls for a beautiful dolphin named Splasha. To prevent the Mayor from dismantling the police department, the cops manufacture a new drug & create a drug epidemic. 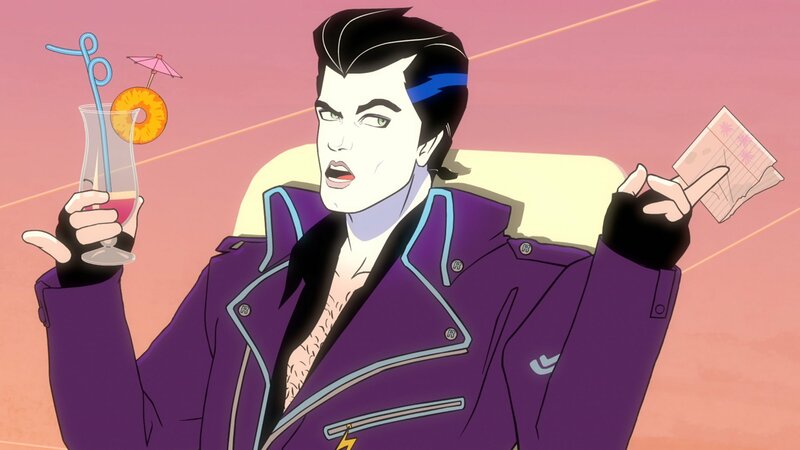 At the elite Moonbeam City Laser Ball, Dazzle starts dating Pizzaz's estranged sister Panache. The Moonbeam PD gathers at the annual Cop Con blowout, where old passions are rekindled between Dazzle and Pizzaz. Dazzle reconnects with his father and Rad gets trapped in a parking garage after he refuses to pay the lost ticket fee. After Rad gets lost in the virtual world of the Moonbeam PD's records room, Dazzle is imprisoned for his murder. Dazzle begins dating a mob boss's daughter, and Rad is pressured by his parents into getting sham-married to his own sister.